This is #23 in a series of blog posts about recovering from the Gulf oil spill and from oil dependency overall. The first introduces the series. 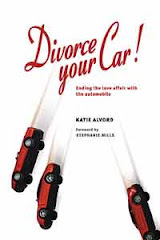 -More than a quarter of U.S. car trips are one mile or less; when Divorce Your Car! came out, 13.7% were a half mile or less. 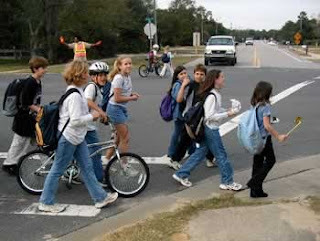 -As of 2001, the U.S. Department of Transportation reports, private vehicles accounted for half of trips between ¼ and ½ mile taken to and from school. Even for kids, ½ mile is generally less than a 15 minute walk. Something’s wrong when so many of us use petroleum to ferry kids such short distances. But here's the good news: these numbers represent a huge opportunity to reduce dependence on oil. How can we do this? 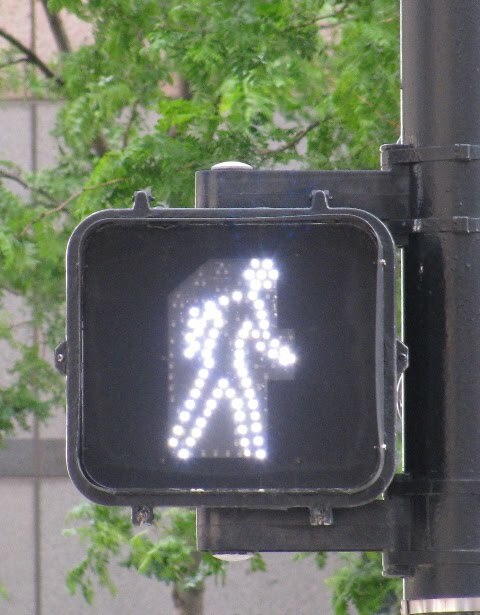 I like to think of it as recultivating a culture of walking. With our motorized mindset, we tend to underestimate what we can accomplish on two feet. Perhaps we can start by expanding the notion of "walking distance." It might help if we recognized that driving short distances doesn't save much time. Consider one recent study that determined every hour behind the wheel leads to a 20-minute loss of life expectancy due to car crash risks. In addition, every car trip taken instead of a walk shortens life expectancy, because as numerous studies show, walking extends life spans. Factor in calculations by Ivan Illich of all the hours we spend maintaining, earning money for, and otherwise attending to automobiles, and we might even lose time by driving. As Illich famously figured, "The model American puts in 1,600 hours to get 7,500 miles; less than 5 miles per hour." 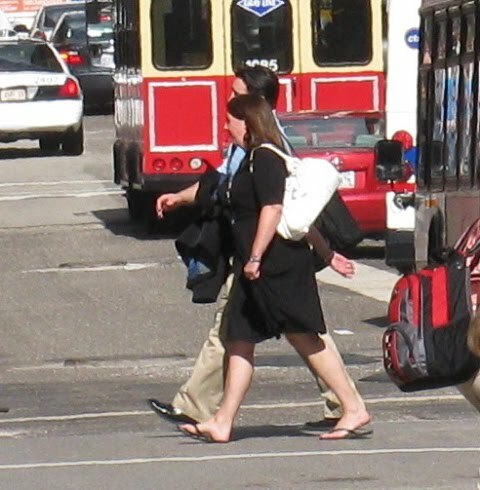 We can also support a walking culture by giving pedestrians priority. 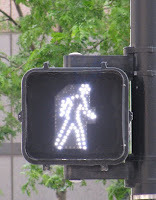 I got early training in pedestrian rights from my father. In leading my sisters and I across busy streets, Dad would routinely glare at oncoming traffic and call out, "5-6-0-A!" At the time, this was the vehicle code section that gave pedestrians the right of way in California. He repeated this often enough to instill in me a sense of righteous indignation at any cars that might whiz by, ignoring the state-given rights so clearly important to my Dad. Most states have pedestrian right-of-way laws like this, but they are too often ignored or unenforced. Some walking groups have worked to improve this situation; one creative approach used by the Willamette Pedestrian Coalition in Oregon involved successive Burma-Shave-style signs of doggerel verse. As group members carried these placards across intersections, motorists would read – sign by sign – verses like: "When Mary tried/ To cross the road/ Not a single /Driver slowed./ As you hurry/ Home today/ Give pedestrians/ The right of way." I'm sure I'm missing some, and invite you to add to this list in the comments section below. The work of these groups and the walking all of us do can not only reduce oil dependence but also cut traffic congestion, diminish pollution, work off extra weight and extend our lives. Why use toxic petroleum to fuel short driving trips when we can gain all that by walking instead? The best book I've ever read on walking is Rebecca Solnit's "Wanderlust." It's a fascinating history of bipedalism -- including the fight for access and rights of way -- and an inspiration to hoof it. I agree, this is a wonderful book. Thanks for the suggestion, Sharon! Another title I like is an older book called "The Magic of Walking" by Aaron Sussman and Ruth Goode. It first came out in the early 1960s and was followed by a revised edition in 1980. Our library has it, so I'll check it out. Thanks, Katie!